On this date, World War I Veteran and MI Alpha Brother First Lieutenant Howard Thornburg Baker, U.S. Army Air Corps died of wounds received two days earlier. He was 26 years old, yet he lived an incredible life filled with commitment. Brother Baker, of Williamsport, PA, enlisted in the British Army after graduating from the University of Michigan, and served 22 months in the trenches of Europe, in addition to much service behind the lines. In JUL 1917, he enlisted in the U.S. Army, and was commissioned a First Lieutenant in the Coast Artillery. On 28 MAY 1918, he joined the 91st Aero Squadron American Expeditionary Forces. Howard was mortally wounded in aerial combat during an evening reconnaissance on 12 AUG 1919 about five miles behind the German lines when he was attacked. The Croix de Guerre with Palm was awarded posthumously to First Lieutenant Baker by Marshal Petain, Commander-in-Chief of the French forces in the field, and his parents were sent the medal and copy of the citation. Brother Baker was buried with full military honors, and respect can be paid to him at Plot D, Row 27, Grave 2 at St. Mihiel American Cemetery, Thiaucourt, France. Following his graduation from Duke University, NC Gamma Brother James H. Spence entered the service of the U.S. Army Air Corps on this date. He would attain the rank of Staff Sergeant before being discharged from his WWII service in 1946. On this date, World War II Veteran and WI Alpha Brother Second Lieutenant Stephen R. Boren, U.S. Army Air Corps made the ultimate sacrifice while killed in action when his P-51D Mustang crashed during a strafing run near Troesnes, France. The Marinette, Wisconsin native joined the 335th Fighter Squadron of the 4th Fighter Group, 8th Air Force in July and was on his second mission when he was killed. Based on a review of the previously classified eyewitness account and missing air crew report, as well as communication with the squadron historian, it appears that Brother Boren’s remains were not recoverable and/or recognizable due to nature of the crash, and because other pilots went down that day in that area causing confusion among German investigators. Operation ENDURING FREEDOM Veteran and TN Gamma Brother Staff Sergeant Tanner Stephen Kuth, U.S. Army was wounded while riding in a vehicle when it was hit by an improvised explosive device. Thankfully, Brother Kuth is alive and well, and doing great things to support and encourage veterans. NC Beta Brother Lieutenant Colonel Matthew D. “David” Cooper, U.S. Marine Corps (Retired) was commissioned a Second Lieutenant in the USMC on this date and began his amazing career. U.S. Navy Veteran OR Alpha Brother Thomas Dale Walt died on this date in Raleigh, North Carolina following a hard-fought battle with cancer. At Oregon State, Brother Walt was captain of the Navy ROTC Scabbard and Blade honor society. He was 63 years old. Following graduation in 1969, he entered the U.S. Navy and was stationed in Washington DC, where he served for five years in the Division of Naval Reactors under Admiral H.G. Rickover. On this date, World War II Veteran and OH Epsilon President Lieutenant Commander Charles Henson “Chuck” Pulley, U.S. Navy died in Lexington, Kentucky of complications from Parkinson’s Disease. Brother Pulley joined the Navy in 1941, where he attained the rank of Lieutenant Commander, trained as a fighter pilot, served with naval intelligence and worked in the research and development of the parachute, a step that set the direction for his life's work as a safety advocate. His work in parachute research led to his first job with Irving Air Chute in 1950. He became president of the company in 1962, which became Irvin Industries, and began the manufacture of automotive seat belts for General Motors. This established his life-long mission to promote automotive safety and seat belt use worldwide. His advocacy took him throughout the world to address legislative bodies, safety organizations and national media on the life-saving benefits of safety belts and brought him international recognition. U.S. Army Korean War Veteran and CO Delta Brother Robert W. “Bob” MacCannon died on this date in Pueblo, Colorado. Bob joined SigEp and the ROTC program at Colorado School of Mines. A 1951 graduate of Mines, he received a second degree in mining engineering in 1954. During the Korean War, Brother MacCannon served in the Army as a member of the 82nd Airborne Division. After his service, he worked in Colorado Fuel and Iron Corporation’s mining department, primarily involved in iron ore production. Bob was past president of the Wyoming Mining Association, a member of the American Institute of Mining Engineering, and authored the book, Sunrise: A Chronology of a Wyoming Mine. Brother MacCannon requested he be cremated, and the location of his ashes is unknown. On this date, U.S. Coast Guard Auxiliary Veteran, Distinguished Alumni Award Recipient and NJ Beta Brother John S. Witemeyer, III, and U.S. Army Air Corps World War II Veteran and WA Alpha Brother Frederick C. “Bobo” Brayton were awarded the Order of the Golden Heart at Conclave in Phoenix, AZ. KY Delta Brother Frank E. Maze, 66, died on this date at his home in Louisville, Kentucky. He was a U.S. Army veteran and served in the 18th Airborne Corps. Born in Jacksonville, FL, Frank graduated from Western Kentucky University with a BA in government, and was a Kentucky Colonel. In 2004, Frank retired from Hexion Specialty Chemicals, formerly Borden Chemical. An avid U of L fan, Frank also loved horseracing and always had a hot tip. Memorial gifts may be made to Little Sisters of the Poor, 15 Audubon Plaza Drive, Louisville, KY 40217. Respect can be paid to Brother Maze at Calvary Cemetery, Louisville. On this date, U.S. Army Veteran OK Beta President Robert M. "Bob" Jernigan, Sr. died in Oklahoma City, Oklahoma. After serving his country in the Army, Bob completed his undergraduate degree at the University of Oklahoma. 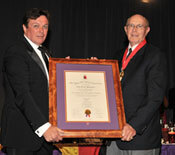 Bob cherished the SigEp brotherhood and remained active in the Fraternity during his lifetime. In Tulsa, Bob worked for Channel 8 and relished a brief brush with "stardom" when he played "Captain Ben" on a local children's television show. Brother Jernigan returned to OKC, graduated from OU Law School in 1967, and began a long legal career in general practice with an emphasis in Municipal and Telecommunications Law. He later served as the City Attorney for Warr Acres for many years, as well as the City of Newcastle. Bob also served as a Municipal Judge in Bethany. He was an avid collector of WWII memorabilia, and had a passion for history and genealogy. Respect can be paid to Brother Jernigan at Resurrection Memorial Cemetery in Oklahoma City. Operation IRAQI FREEDOM Veteran and VT Gamma Brother Lieutenant General Michael D. Dubie, U.S. Air Force was promoted to his current rank on this date. Currently, Brother Dubie serves as Deputy Commander of United States Northern Command. U.S. Navy Veteran MI Alpha Brother John Henry Jacobs died on this date at the age of 84 after a short battle with Leukemia. After graduating with a degree in Engineering, John attended Officer's Candidate School and served for several years in the U.S. Navy at Mare Island, CA. Following the Navy, John moved to Cleveland, Ohio where he worked as a sales engineer for General Motors. * Vietnam War Veteran and KS Beta Brother Lieutenant Colonel Bruce Everett Smith, U.S. Army (Retired) passed away in Peabody, Kansas. He was 73 years old. Upon graduation was Kansas State, Brother Smith was commissioned a Second Lieutenant in the U.S. Army, served two tours in Vietnam, and 22 years of service before retiring in 1984. Memorials have been established with the Peabody Senior Center, the Peabody Community Foundation Fund, and American Legion Post 95 in Peabody. * World War II and Korean War Veteran, Order of the Golden Heart Recipient, and AL Alpha Brother Sergeant Robert M. Cheney, U.S. Marine Corps passed away 08 AUG. Near the end of WWII (July 1946), Bob enlisted in the USMC and served for three years. He re-enlisted in 1951 and served during the Korean conflict until 1952. Brother Cheney graduated from Auburn University in Business Administration in 1954. * World War II Veteran and OH Gamma Brother Ensign Lynn Seeley Kelley, U.S. Navy passed away 09 AUG in Camden, South Carolina. He was 92 years old. * U.S. Navy Veteran GA Alpha President Raymond Douglas Wood passed away 10 AUG in Savannah, Georgia. Brother Wood served as a supply officer on the destroyer minelayer USS Gwinn (DM-33) from 1954 to 1956 in Charleston, South Carolina. * Life Trustee of the Sigma Phi Epsilon Educational Foundation, SigEp Citation Recipient and TX Alpha Brother First Lieutenant Byron McLean “Mack” Rankin, Jr., U.S. Army passed away 14 AUG in Dallas, Texas. Brother Rankin proudly spent four years serving as a First Lieutenant, and eventually an Officer of Procurement in the United States Army during the implementation of The Marshall Plan while stationed in Germany after WWII. Our thoughts and prayers go out to the family, friends and chapter brothers of SigEp Patriots Smith, Cheney, Kelley, Wood and Rankin. While they are no longer with us, SPP believes the greatest casualty is being forgotten and we pledge these Brothers will always be remembered. * 12 AUG – U.S. Army CA Theta Brother Cameron Jost and his wife, Nicole, are the proud parents of future SigEp Keegan Darrell Jost born on this date at Tripler Army Medical Center, Honolulu, Hawaii. KS Beta Brother First Lieutenant Matt Cavanaugh, U.S. Army popped the question on this day and with a yes is now engaged to Ms. Meagan Chewing. Best of luck to Cameron and Matt!